A, Arteriogram in a patient with cirrhosis and hepatocellular carcinoma (arrows) whose indocyanine green 15-minute retention rate was 20.8%. B, Liver transection plane after resection of Couinaud segment 8. Star indicates right hepatic vein; MHV, middle hepatic vein. Computed tomographic scans in a patient with cirrhosis and hepatocellular carcinoma (arrows) whose indocyanine green 15-minute retention rate was 18.0%. A, The tumor was located at Couinaud segments 7 and 9. B, Couinaud segments 5 and 6, however, were free of tumor. C, Liver transection plane after resection of Couinaud segments 7 and 8. The inferior right hepatic vein was preserved in this patient, as described by Makuuchi et al.22 Star indicates middle hepatic vein; D, diaphragm. A, Computed tomographic scan in a patient with cirrhosis and hepatocellular carcinoma (arrows) whose indocyanine green 15-minute retention rate was 15.6%. B, Liver transection plane after resection of right anterior segment (Couinaud segments 5 and 8). FL indicates falciform ligament; LM, left medial segment (Couinaud segment 4); LL, left lateral segment (Couinaud segments 2 and 3); and RP, right posterior segment (Couinaud segments 6 and 7). A, Computed tomographic scan in a patient with cirrhosis and hepatocellular carcinoma (arrows) whose indocyanine green 15-minute retention rate was 4.6%. B, Liver transection plane after mesohepatectomy (resection of Couinaud segments 4, 5, and 8). LL indicates left lateral segment (Couinaud segments 2 and 3); RP, right posterior segment (Couinaud segments 6 and 7). Postoperative changes in levels of serum total bilirubin, aspartate aminotransferase (AST), alanine aminotransferase (ALT), and lactate dehydrogenase (LDH). Error bars indicate SEM. Groups are described in the "Methods" section. To convert bilirubin values to micromoles per liter, multiply by 17.1. Background Intermittent occlusion of hepatic blood inflow by means of a hemihepatic or total hepatic occlusion technique is essential for reducing operative blood loss. Central liver resection to preserve more functioning liver parenchyma is mandatory for centrally located liver tumors in patients with cirrhosis, but it requires a longer overall hepatic ischemic time because of a wide transection plane. No controlled comparison has been performed for the 2 techniques in these operations. Hypothesis Hemihepatic inflow occlusion may be beneficial in cirrhotic patients who undergo complex central hepatectomy with a wide liver transection plane. Design A prospective, randomized study. Setting University hospital and tertiary referral center. Patients During liver parenchymal transection, 58 cirrhotic patients who underwent complex central liver resections with a wide transection plane were prospectively randomized into 2 groups. In the group undergoing total hepatic inflow clamping (group T; n = 28), occlusion of hepatic blood inflow was performed for 15 minutes with declamping for 5 minutes. In the group undergoing selective clamping of ipsilateral blood inflow (group H; n = 30), clamping was performed for 30 minutes with declamping for 5 minutes. Intervention Comparison of patient backgrounds, operative procedures, and early postoperative results. Main Outcome Measures Operative blood loss, need for blood transfusion, and postoperative morbidity. Results The patients' backgrounds, operative procedures, and area of liver transection plane were not significantly different between the 2 groups. In all patients, the liver transection areas were greater than 60 cm2 and overall liver ischemic times were greater than 60 minutes. The amount of operative blood loss and incidence of blood transfusion were significantly greater in group T because of greater blood loss during declamping. Overall liver ischemic and total operative times, postoperative morbidity, and postoperative changes in liver enzyme levels were not significantly different between groups. No in-hospital deaths occurred in either group. Conclusions Intermittent hemihepatic and total occlusion of hepatic blood inflow are safe in cirrhotic patients with an overall ischemic time of greater than 60 minutes. However, for complex liver resections with an estimated liver transection plane of greater than 60 cm2, hemihepatic occlusion of blood inflow, if feasible, may be recommended in cirrhotic patients to reduce operative blood loss and the incidence of blood transfusion under our defined occlusion time. Previous comparisons between the intermittent total and unilateral hepatic inflow occlusion methods were performed by means of retrospective review.14 However, the results of controlled studies that focus on cirrhotic liver resection, especially when a long total ischemic time is required, have never been reported. In this study, we performed a prospective randomized comparison of the 2 methods of complex liver resections for cirrhotic patients to define their advantages and disadvantages. In the 6 years from January 1, 1996, through December 31, 2001, 308 cirrhotic patients underwent liver resection for liver tumors at our institution. Before operation, all patients underwent conventional liver function tests (including Child-Pugh grade21), indocyanine green clearance tests, and imaging studies including abdominal ultrasonography, computed tomography, and angiography. Fifty-eight patients who had no previous biliary operations and no preoperative therapies and whose main tumor was located at the central portion of the liver (defined as Couinaud segments 4, 5, and 8) without having directly invaded the hepatic hilar plate were included in this prospective study. Study patients required the following resection procedures: total resection of Couinaud segment 818 (Figure 1), in some cases with extension to segment 7 by preserving the right inferior hepatic vein (Figure 2)22; resection of the right anterior segment19 (Couinaud segments 5 and 8) (Figure 3); mesohepatectomy2,3 (resection of Couinaud segments 4, 5, and 8) (Figure 4); and resection of the left medial segment (Couinaud segment 4),13 in some cases with extension to Couinaud segment 3.23 Multiple liver resections11,14 that included at least 1 of these procedures were also included in this study. Although the liver resection procedures were complex, total liver ischemia could be performed only during liver parenchymal transection, because the ipsilateral inflow vessels should be divided. Therefore, procedures such as extended right or left hepatectomy2,11,17 were not included in this study. Because extended right or left hepatectomy results in amputation of one side of the liver, the liver transection plane may not be as wide as that for central liver resection. Moreover, the hemihepatic occlusion method cannot be applied in such operations. Patients who needed total vascular exclusion techniques11 were also excluded. Informed consent was obtained from each patient before the operation. All operations were performed or guided by the same surgeon (C.-C.W.). If the tumor condition and procedures fulfilled the aforementioned criteria, randomization was performed by opening a sealed envelope after the abdomen was explored. When the patient was categorized in the total inflow occlusion group (group T), the hepatoduodenal ligament was clamped with a Satinsky vascular clamp during liver transection.6 Aberrant left hepatic arteries from the left gastric artery in the lesser omentum were also clamped. Intermittent pedicle clamping was performed by means of occlusion of blood inflow for 15 minutes and then release for 5 minutes until the transection was complete and the bleeding from the hepatic veins was checked. During liver transection, the vessels on the tumor side were clamped with metallic clips, and vessels on the preserved side were ligated with silk. In the declamping period, some dry gauze pads were inserted between the transection planes, and hemostasis was temporarily performed by means of bimanual compression of the liver. Before each declamping, intra-abdominal blood was evacuated and measured as the amount of the blood loss during liver parenchymal transection. At the end of the declamping period, before the next clamping, the intra-abdominal blood was sucked out and counted as blood loss during the declamping period. The amount of bleeding during liver parenchymal transection and the declamping period of the operation was measured as blood loss during each clamping and declamping period. The amount of blood loss after completion of specimen removal was also counted as blood loss during parenchymal transection. Blood transfusion was performed under a restrictive policy.25 After liver transection, a sheet of dry gauze was applied to the cutting surface of the liver, and the transection area was measured from the area that corresponded to the blood-tinged area. Overall liver transection time was calculated from the beginning to the end of liver parenchymal transection. Because no liver transection was performed during the declamping period, the declamping duration was not included in the liver transection time. After the operation, the levels of serum total bilirubin, aspartate aminotransferase, alanine aminotransferase, and lactate dehydrogenase were measured on postoperative days 1, 3, 5, and 7. Postoperative morbidity or mortality was defined as complications or deaths that occurred within 30 days after the operation or during the same hospitalization. The background characteristics and intraoperative and postoperative results between both groups were compared. The frequencies were compared by the Pearson χ2 test or the Fisher exact test. Continuous variables are presented as mean ± SEM (range) and compared using the Mann-Whitney test. P<.05 indicates a significant difference. Group T included 28 patients; group H, 30 patients. Their background features are compared in Table 1. We found no significant differences between the 2 groups. Table 2 shows the resection area of the liver and other operative procedures. Because of varied liver resection procedures, no statistical differences could be found between groups. Moreover, the extent of liver resection, need for multiple resection, and associated procedures did not differ between groups. All procedures resulted in a wide resection plane (>60 cm2) and required a long overall clamping time (>60 minutes). No significant differences could be found between groups regarding the resected liver weight, overall ischemic time, liver parenchymal transection time, area of liver cut surface, and operative time. The amount of blood loss during liver parenchymal transection between groups was not significantly different, but the amount of blood loss in the declamping period was significantly greater in group T. Thus, the amount of operative blood loss and the incidence of blood transfusion were significantly greater in group T patients (Table 3). However, the mean amount of blood transfused per patient in both groups was not significantly different (group T, 1017 ± 106 mL [500-3500 mL]; group H, 896 ± 161 mL [500-3000 mL]; P = .63). Figure 5 shows the changes in serum total bilirubin and liver enzyme (aspartate aminotransferase, alanine aminotransferase, and lactate dehydrogenase) levels during the postoperative period. Compared with the preoperative data, the serum total bilirubin and liver enzyme levels were significantly elevated on postoperative days 1 and 3 and gradually returned to the preoperative level after 1 week. No significant differences could be found in any item on any day between the 2 groups in the postoperative period. Postoperative complications in both groups are shown in Table 4. Complication rates were not significantly different between groups (P = .78). Patients with bile leaks were treated by means of intraoperatively placed drains. Intra-abdominal abscesses were treated by percutaneous drainage. Ascites and pleural effusion were treated with diuretics. No patient in either group required reoperation. All patients could be discharged from the hospital without hospital death. No differences regarding length of postoperative stay could be found between the 2 groups. Because the hemihepatic inflow clamp is not needed for simple hepatectomy procedures,3,5,6,14,25 we compared the effects of total and unilateral liver ischemia only in complex central liver resections that result in a wide resectional area. Thus, among the cirrhotic patients who underwent hepatectomy in the 6-year study period, we selected only 58 (19%) of 308. 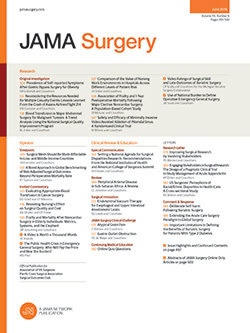 The procedures presented herein are more difficult and time-consuming than conventional major hepatectomies.2,3,15 The transected plane was also wider than that in previous studies of liver ischemia.10,13,15 Although the amount of the resected liver was not as large as in a conventional major hepatectomy, a wider liver transection plane was created and a longer liver parenchymal transection time was required. The optimal time span in each cycle of intermittent occlusion of hepatic blood inflow in rats with noncirrhotic liver is 15 minutes for clamping and 15 minutes for reperfusion.9 However, the optimal duration of clamping of each liver pedicle in cirrhotic patients has not been universally defined. Because continuous total ischemia exceeding 30 to 40 minutes is risky in patients with abnormal liver parenchyma,10,12,26 we used the most commonly proposed time span,3,5-8,10,12,14 ie, clamping for 15 minutes and declamping for 5 minutes in group T patients, and clamping for 30 minutes and declamping for 5 minutes in group H patients. The safety limit of occlusion of hepatic blood inflow in the cirrhotic liver also remains undefined.7,11,14 Using the current time span for liver pedicle clamping, we experienced a safe overall ischemic time of 204 minutes for intermittent global ischemia in cirrhotic patients.7 In noncirrhotic patients, some authors have claimed a safe overall liver ischemic time of 322 minutes.14 For cirrhotic patients, the longest overall ischemic duration for hemihepatic clamping was reported as 207 minutes.14 However, using a 20-minute and 5-minute cycle in total liver pedicle clamping and declamping, respectively, surgeons in Hong Kong claimed that the longest limit is 120 minutes.13,15 After this period, the authors suggested that liver parenchyma should be dissected without occlusion of hepatic blood inflow. This time limit may sometimes not be long enough for some complex procedures. In fact, bleeding at the deep area of the transection plane still occurs and may disturb the operative field. Moreover, liver transection under a hurried and flustered condition may cause inadvertant ligation of the major intrahepatic vessels, which is dangerous for cirrhotic patients because ischemic or congestive necrosis will occur in the remnant liver and may cause liver failure. We ligated the bleeding vessels under occlusion of hepatic blood inflow until bleeding from the hepatic veins was stopped; then, bleeding from the hepatic artery and portal vein was checked after pedicle declamping. At this phase, hemostasis could be accurately accomplished without hurry. Our findings are similar to those of others14 in that none of the patients whose overall pedicle clamping time exceeded 120 minutes died while using either method of hepatic inflow occlusion. Long-term sequelae were not observed in any patient. Nevertheless, the optimal time span and safe limit of intermittent ischemia in cirrhotic liver resection of each method require further investigation. Previous retrospective studies have suggested that selective hepatic inflow clamping has some benefits when a longer overall ischemia is required.14 Theoretically, the blood flow in 1 lobe of the liver in group H is preserved, and the liver function damage in this group may be less than that in group T.12,14 When we compared the 2 groups in this study, the patient background characteristics, preoperative liver functions, operative procedures, liver transection times, and overall ischemic times were not significantly different. No differences of postoperative complications could be observed between the 2 groups. The changes in liver enzyme and serum bilirubin levels after the operation did not differ between the groups because of the similar area of liver transection planes and similar amounts of resected liver. Therefore, for overall ischemic duration exceeding 60 minutes, the effect and safety of intermittent hemihepatic and total hepatic ischemia are similar. The time spans in occlusion of total hepatic and hemihepatic blood inflow in this study are artificially defined. A previous retrospective study14 did not show any differences between the groups because of different overall ischemic times. However, in the present study, the total amount of operative bleeding was greater in group T than in group H (P = .049). Because the liver transection plane was similar in both groups, the liver parenchymal transection time was also similar. However, the amount of blood loss in the declamping periods was significantly greater in group T. Because it is very difficult to perform total bimanual compression of a wide transection plane, especially when parenchymal dissection progresses into a deep area, some blood loss may still occur during the declamping period. Thus, a greater amount of blood loss in the declamping period in group T ensued because of a longer overall declamping time. A similar result was demonstrated by Belghiti et al10 regarding comparison of intermittent and continuous liver pedicle clamping for hepatectomy. In their report, the declamping period was also included in liver parenchymal transection time. Therefore, intermittent pedicle clamping was associated with significantly greater blood loss during liver transection.10 On the basis of our findings, we speculate that if the time span of pedicle clamping in group T was lengthened to 30 minutes, the overall blood loss between the 2 groups would be similar. However, we did not consider it ethical to extend this procedure to all cirrhotic patients. Although an additional 20 to 30 minutes was required for dissection of the liver pedicle in the group H patients, a shorter overall declamping period resulted in similar overall operative times in the 2 groups. Use of an en masse technique for hemihepatic clamping27 may reduce the duration for portal vein and hepatic artery dissection. However, we did not use this technique in group H patients. Although group H patients had less operative blood loss and less incidence of blood transfusion under our defined time span, some limitations of hemihepatic clamping were found. For example, when a malignant tumor directly invades or densely adheres to the hepatic hilar plate, forceful dissection of the pedicle may cause a tumor rupture or vascular injury. For patients undergoing reoperations or who have undergone a preoperative arterial embolization, hemihepatic clamping may also be difficult because of dense adhesion of hepatic hilum.12 Moreover, this technique cannot be used in patients with the absence of portal vein or hepatic artery bifurcation.16,28,29 In addition, as aforementioned, this technique is not necessary for hepatectomy with a narrow liver resection plane because the Pringle maneuver is simpler and substantial blood loss is rare. Accepted for publication June 15, 2002. This study was supported in part by grant NSC 90-2314-075A-018 from the National Science Council, Taipei, Taiwan. We thank F. L. Kuo for her statistical assistance. Corresponding author and reprints: Cheng-Chung Wu, MD, Department of Surgery, Taichung Veterans General Hospital, Section 3, 160 Chung-Kang Rd, Taichung, Taiwan (e-mail: he@vghtc.vghtc.gov.tw).